It was being billed as one of the Class AA contests of the year. As it turned out, it ended up being no contest. Fairmont Senior dominated offensively, defensively and turned a somewhat close game at the half into a comfortable 45-14 win this evening at East-West Stadium. The Polar Bears moved to 4-0 on the year, while the Indians fell to 3-1 and suffered their third-straight loss to their Marion County foe. While there were plenty of reasons for Fairmont Senior’s victory, the biggest factor was senior Connor Neal’s ability at quarterback and the Indians’ inability to stop him. Neal finished the game 21-of-25 for 313 yards and four touchdowns. He didn’t have an interception. “You’ve got to contain him. That’s the thing, the times we did get a rush our ends didn’t contain … The bottom line is our guys didn’t make plays,” said Cole about Neal. “There were certain things we had to do to have a chance to be in this game and possibly win it and we didn’t do it. To compound matters, the Indians had more than Neal and his arm to deal with. BHS allowed 179 yards on the ground to a Fairmont team missing its top rusher due to injury. For a Tribe team that tries to make their foe one-dimensional, it made things impossible as Fairmont scored on every possession of the game with the exception of its last when reserves entered the contest. It was in the second half where Fairmont Senior put an end to any thoughts of a Bridgeport comeback. And holding a 17-7 lead and getting the ball to start the third quarter, it didn’t take long for the Polar Bears to make a statement that a comeback wasn’t going to happen. Fairmont Senior’s first two drives required a total of four plays and resulted in 14 points. 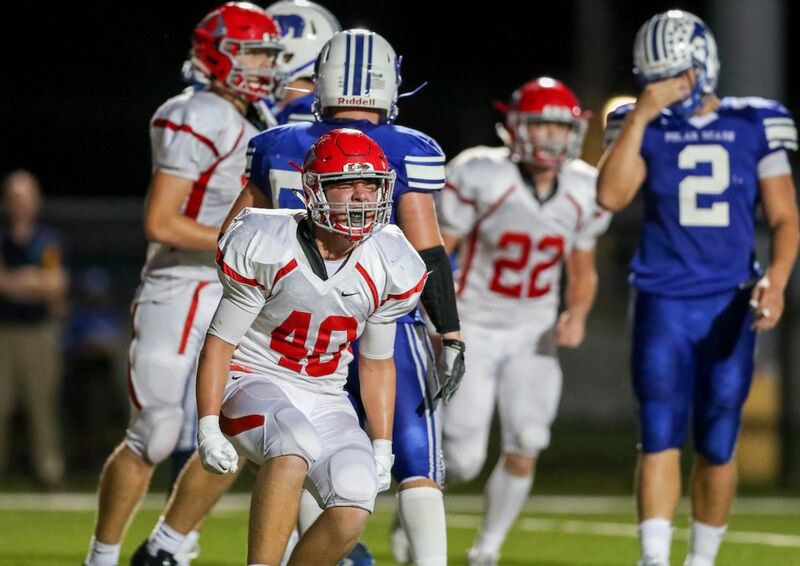 The first score came on a second-and-10 play when Neal hit Jacob Pitman on a 57-yard pass and run that made it 24-7 at the 11:31 mark of the third as Frankie Smith connected on the third of six successful point-after kicks after the score. The second two-play touchdown drive came after Bridgeport managed to get the ball to the Fairmont 29-yard line on its first second half possession. A fourth down penalty by BHS was followed by a fourth down sack and the Polar Bears started their next series at their own 42. After an 18-yard pass from Neal to Camden Longwell, Rhett Heston showed the decision to move him from wideout to tailback was a good one. He got the handoff and went 40 yards for the score and a 31-7 lead at the 7:50 mark. Bridgeport’s last hope came on its next series. With Fairmont packing the box, Jake Bowen would make them pay. Bowen took a second down handoff up the gut, broke a pair of tackles and then outraced everyone to the end zone from 72 yards out. The second of two Evan Ogden point-after kicks made it 31-14 at the 6:55 mark. The kick by Ogden would be the final points of the game for BHS. Fairmont would punch it in two more times after Bowen’s run to produce the most points against a BHS team since a loss to Parkersburg in 2007 in the Class AAA quarterfinals. The first came when Neal hit Pitman on a 17-yard scoring pass with 4:52 left in the third. The next time the Bears had the ball, sophomore Keishawn Cottingham took what appeared to be a play headed for a big loss and turned it into a 35-yard touchdown run and the game’s final touchdown at the 9:02 mark of the fourth. Neal connected with six different receivers in the game. Longwell finished with eight catches for 121 yards and Pitman had five catches for 120 yards and three touchdowns. Heston finished with 96 yards on seven carries. Bowen would finish the game with 20 carries for 136 yards and a touchdown. Trey Pancake looked good as well as he had a season-high 14 carries for 69 yards. While the second half was bad, the first half wasn’t one Cole was likely thrilled about. In fact, things couldn’t have started any worse for the Indians. Their first two possessions were three-and-outs and resulted in zero first downs and a total of five yards. Fairmont Senior, on the other hand, was clicking offensively from the start. On their first possession of the game, the Polar Bears showed they didn’t need to rely on the big play to score and used a 15-play drive that covered 73 yards and ate up 7:13 of the first period clock. Neal, as he was throughout the game, was just about flawless. Running just four times on the drive, Neal went 10-of-11 for the hosts with quick screens, short pass plays, slants and other low risk plays that resulted in positive yards. When Bridgeport’s defense whiffed on tackles a few times, the routine pass plays turned into double digit gains. BHS had two chances to stop the Bears’ opening drive. The first came on the only bad pass Neal had in the first half as an Indian defender saw the ball go through his hands. The second came on a fourth-and-one play at Bridgeport’s 22-yard line. On the critical play, Bridgeport appeared to have Gage Michael wrapped up for a loss. Instead, Michael kept his legs moving and got a two-yard gain to keep the Bears’ opening drive alive. Three plays and three completed passes later Fairmont was on the board. The first of two successful point-after kicks in the half by Smith made it 7-0. Fairmont took advantage of the second strong defensive stand when its offense got back on the field. This time the scoring drive didn’t need nearly as many plays or nearly as much clock. Fairmont used six plays to cover 73 yards once again and go up 14-0. This time, Neal hit Pitman on a six-yard slant from the left side for an easy score with 10:48 to go. It was at this time that Bridgeport’s offense finally woke up. Starting at their own 27, the Tribe went to work and got more than just their initial first down at the 9:58 mark on a Bowen 10-yard run. The Indians got the clock-killing drive Cole said heading into the contest they needed to have in order to compete. Bridgeport used 18 plays to cover 73 yards and get its first points of the game. The drive featured two fourth-down conversions and ended at the 1:04 mark to eat up 10:44 of the frame and make it 14-7 when Ogden connected on the extra point. Unfortunately for Bridgeport there was still a bad spot remaining in the first half. Just over a minute showed on the scoreboard as well as three timeouts for the home team and that was more than enough for the Polar Bear offense to work with. Starting yet again at the 27, the hosts used six plays to get into field goal range. It almost turned out worse. Fairmont Senior got all the way to the Bridgeport six when Neal calmly floated a pass out of the back of the end zone with one second left before halftime to allow Smith to come on for a 25-yard field goal attempt. Smith’s kick split the uprights and the Bears managed to make it a two-possession game at 17-7 and put points on the board on all three of their first half drives. Fairmont Senior ended the first half with 228 yards. Neal was the catalyst as he went 16-for-18 for 168 yards. What made it worse for Bridgeport was that Fairmont managed to amass 60 yards on the ground. Bridgeport finished the first half with just 76 yards. All but three of those yards came on their scoring drive. Bowen led the way with 50 yards on 15 carries. The Indians return to action next week and things won’t be easy. The Tribe will face Harrison County rival Robert C. Byrd at Wayne Jamison Field at 7 p.m.
Fairmont Senior will host University. The contest will be at East-West Stadium. Editor's Note: Photos by Ben Queen of www.benqueenphotography.com.